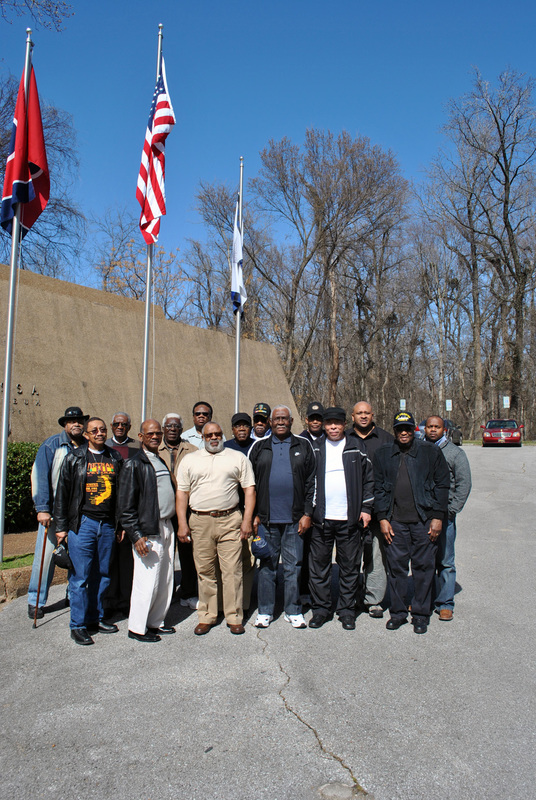 Veterans of the U.S. military attending Black History Month event at the C.H. Nash Museum, 2012. A key component for museums to engage with communities to address issues such as Ferguson, or any issue for that matter, is to be at least perceived as a stakeholder and social asset of the affected community. If a museum is divorced from and does not reflect the community needs, there is no reason for that community to consider proclamations around Ferguson or racial justice as anything other than a jailhouse conversion. I suggest that the community engagement process must be in place long before the events such as Ferguson occur. Co-creative processes are not museums functioning for the community but with the community. The distinction necessitates having a recognized and committed stake in the community’s expressed needs. The co-creative process must be part of the normative operation of the museum, not just in crisis situations. This distinction necessitates a museum to have a long-term commitment and co-creative action plan. Hosting Black History month events provide an excellent opportunity for a museum to be of service to the African-American community. In February of 2015, such events can provide a forum for a discussion of racial justice and other issues raised by Ferguson. Over the past five years at the C.H. Nash Museum at Chucalissa, we have moved from a co-creative Black History month event to one where our museum serves as a host per Nina Simon’s Participatory Museum model. Today is the day a museum can begin a long-term commitment to the process. In so doing, museums will be better able to organically respond to current and future issues affecting the communities in which we serve. A summary of our experience in community engagement at the C.H. Nash Museum is presented in this article. ¹ John Cotton Dana, The New Museum (Woodstock: Elm Tree Press, 1917), 38. ² Elizabeth Hirzy, Mastering Civic Engagement: A Report from the American Association of Museums. In, AAM (Ed. ), Mastering Civic Engagement: A Challenge to Museums (pp. 9-20). Washington, DC: American Alliance of Museums. ³ Nina Simon, The Participatory Museum (Santa Cruz: Museum 2.0, 2010), 187. 4 R.F. Kronick, R.B. Cunningham, and M. Gourley, Experiencing Service Learning (Knoxville: The University of Tennessee Press) p. 23. ← Why You Need to Donate to Small Museums Now!